“Dealing with the loss of one who was so special to me is very difficult. I wanted to make sure that you knew how important Middleton was to mom and especially to me. When mom first arrived to the AL side, she was welcomed by all your staff, the aides, nurses, hairdresser and cafeteria staff, as well as the custodial staff was always helpful, kind and cheerful to her. She felt like she belonged. I was so confident that she would be happy there. All of you in the front offices, (Debbie, Max, Cathy, Jan and others), were always friendly and helpful to me. I, too felt like I belonged. My mom and I enjoyed the many activities your activity personnel planned for residents. We especially enjoyed hanging out at the pub singing songs (yea, Patty), the music performances by the regular singers and special guests from Granville schools. Each special occasion dinner (Thanksgiving, Easter, Luau, etc.) was so much fun and something Mom, my brother and I looked forward to. I have many pictures to help me remember those fun times. As Mom’s dementia became more and more of an issue, and her confusion and anxiety increased, it was with great tact that Kelly talked with me about moving her to the Memory Care Unit. This was the greatest thing for Mom, and for me. I can never explain how important Kelly is to your unit and to me. Her compassion, humor and knowledge round out the love she feels and shows to each person in Memory Care. I hope you realize what a treasure she is! The aides and nurses in the unit were incredible to Mom and me. They could tell how much she had lost, but still treated her like family. They laughed when she was silly and were gentle, kind and loving no matter how many times she asked the same questions or was confused. It takes an incredible spirit to work with dementia residents. Getting Mom into Hospice was also an easy transition and so incredible. During those last weeks, all of us could recognize how much Mom was failing and yet every member of Middleton was so supportive to me and caring toward Mom. With tears streaming down my face, I can’t possibly thank you and your staff enough for showing your love and respect for her. More than 15 workers (from the cafeteria, aides, nurses and activity people) came to see her one last time for a hug or kiss. Some were lucky enough to get that smile or hug back. What a tribute to her and a testament of your incredible Middleton family. Everywhere I go, I compliment the job you all do at Middleton and that it’s the perfect place for many as they age. My sincerest thanks. I will miss you all.” Lisa D.
“The staff is wonderful and always very helpful. Memory unit is run very efficiently and staff is very kind and gentle with residents. My loved one received excellent care while a resident. Middleton has an Alzheimer’s support group and a bereavement support group. Both are run by kind, compassionate people. Many activities take place daily for the residents to participate in. 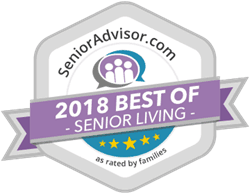 I would recommend Middleton to anyone seeking a place for memory care, independent living or assisted living.” Carol H.
“I have volunteered at Middleton for many parties and have also visited Middleton with my guitar to play for the residents. The staff was very nice and engaged with the residents. It was very clean and the atmosphere is always so fun!” Kate H.
“Middleton Senior Living is a beautiful facility. It is very clean and pleasant. The staff is very friendly and professional and is truly willing to help in any way. They all address the residents by their names and make you feel welcome. There are many activities for the residents to participate in. The dining room is large and enjoyable. There is an on-site beauty shop, chapel, exercise room and theater. I highly recommend Middleton for your home.” Carolyn V.
“Where do you start to express the BEST experience for your parents??? From the office personnel and their attention to detail…to the nursing and care personnel and their kindness and expertise….to the restaurant personnel and chefs for their daily attention to each and every resident’s preferences. I was and still am blown away. Too many good experiences to list! ” Bill B. “We are overwhelmed by your generosity. Your facility is and has been a Godsend for our father, Robert. At 91 going on 92 in March, the past two years have kept him alive and well. Your staff is the greatest. Everyone is so kind and considerate. The facility is neat and clean, always tidy and beautifully decorated for each season. The activities are so much fun and the food is the best as evidenced by your turnout each time. Having to limit the number of guests is evidence of that and the Thanksgiving that grew and grew was spectacalar. I haven’t been able to be at Middleton much this past year, but never have a doubt or concern that Dad is getting the best care and that the staff, from the receptionist to the nurse, are only a phone call away to answer any and all questions. Even the outside doctor and physical therapist you have recommended have been exceptional. We are deeply grateful and forever in your debt. May God bless each and every one of you and may your business continue to grow as you serve the elderly. ” Kay S., Kathy M. and Ken J. “The Octoberfest party was just wonderful! It was great to see the enthusiasm the entire staff had the week before prepping for the party. The food, decorations and entertainment made for such a memorable night. Thank you for going above and beyond! Also want to thank you and your staff for all they do each day to make Middleton such a great home for Mom. I have been very pleased with the care she has received. Your staff is filled with good people! They have been helpful, friendly and always go the extra mile to engage in conversation with her, as well as help the family as we try to meet her needs. They work each day to make Mom feel independent yet receive the care she needs! I could not be happier with the decision we made to move Mom to Middleton…it was definitely worth the wait!!! “Once again… Thank you for all you do to make Middleton such a special place. We are so grateful that Mom has been able to become a part of your family!” Diane S.
“My wife passed away in 2016. I have only one child who wanted me to live with her. She has four teenagers at home, so I didn’t want to upset their life. But my daughter wanted me to be close to her, so she suggested Middleton. I arrived April 1st and everything has been wonderful. I’ve had two strokes and I needed good healthcare. I get that here. I have met numerous friends and every night I eat with the same bunch. Food is good here, a lot of activity to keep me busy. I love this place! !” Tom G.
“Middleton kind of had all those aspects that I was looking for for my mom. For instance a lot more normal kind of lifestyle things: the club, the happy hour, the ability to go out, outdoor living, which is really important to my mom. And she had the ability to choose from the options that they had here. Dining that would allow you to order from a menu, those kinds of things. I think that because with mother here, I feel that it’s given her some safety, some security, while still honoring her independence. And that’s been a comfort for me, that I’m not thinking she’s by herself. She’s very social and she has lots of friends. Lots of activities, which she did not have in her condo. My husband and I were her social outlets, probably for quite a while.” Kathy W.
“Well, I had four things in mind. One was, these apartments look so small, when I was living in a big house and I was looking at empty shells. Two, I was hoping to find a compatible group of people with whom I would have meals three times a day. I was looking for reasonably good food. And I was looking for a competent but friendly staff.” Andy S.
“After trying several facilities, Dad finally has a home! Dad is a resident of McCune Hall, the memory care section of Middleton. The administrators are professional, caring and supportive during the relocation process. The nursing staff and STNAs are attentive and respond quickly when he calls for assistance and the communication between staff and family is exceptional. The facility is new, clean and welcoming to visitors. He is very happy, and we are relieved to have Dad living where we know he is safe and cared for.” Tracy M.
“Best community I have ever been in. I get a lot of help.” Irene W.
“It was harder for me to get around and i couldn’t drive. And so my niece and I decided, it was time for me to find a place where I could have companionship. I just love getting up and coming to the restaurant and having something to eat and not having to worry about my food and the weather of getting out and doing the dishes.” Virginia O. “The building is well-designed and very functional. The interior is extremely wide, decorated, attractive and clean. The administrative staff is efficient, open to suggestions, and involved to an unusual extent. The nursing staff is a really caring group, very attentive and helpful and all of the nurses, waiters and aides are supportive and cheerful. The residents seem to be content and satisfied with the food and activities. What a great day it was when I found Middleton!” June H.
“Middleton is a very nice place for people who need help to maintain everyday living. Very nice people who care about each person here.” Robert J.